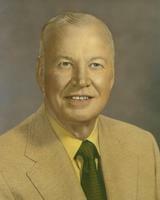 Joe Golding began his career at Denison in 1946 as a football assistant and the head basketball coach. He then moved to Wichita Falls one year later and was promoted to head coach after one year. In his 15 years (1947-1961) his Coyotes reached the state title game six times winning four state championships (1949, 1950, 1958 & 1961). His players, frequently lighter than their opponents, perfected his single-wing offense and compiled a 154-24-2 record. Inducted in THSCA Hall of Fame in 1969, he was Texas High School Coach of the Year in 1949. Coach Golding died on July 5, 1979.